The Internet meeting the TV set. Often very close together in the living room, only a few inches apart, but not joined up … until now. They entered a Boxee competition as a way of exploring this. The ‘Ten foot experience’ is an idea about interaction: one-foot experience is using a mobile device (about one foot from your eyes); three-foot experience is normal desktop web page design; ten-foot experience is the distance away from the screen when you’re watching TV. It’s a similar design challenge to mobile – can’t have too much text, needs to be big. Navigation also needs to be simple – no mouse. Focus is the sofa. Navigation is typically a remote control – you don’t want a keyboard on your knees as well. So limited ways of interacting: number keys, arrows, Ok, maybe a back button if you’re lucky. So need to design to fit that. One example where you may already have seen it: set-top-box/TV, like the red-button service on Freeview, Sky, etc – you can navigate with cursor keys, click OK, plus the colour keys as well. Other attempts to replicate on a computer – e.g. Windows Media Centre. Likewise MythTV – open source equivalent. And is Teletext an early example? Many similar elements: large text, easy way to navigate (page numbers), even news reports only have two or three sentences: so can read from your sofa. Why connect your TV to the Internet? New opportunities: more sources of video, podcasts. In 2008, 1.6b views of TV shows by UK viewers; 5bn by 2013. 22% of respondents to Liam’s toy poll watch video podcasts. Making TV is becoming much easier and cheaper. High def video camera only costs about £100-£150. Editing software much more accessible. Much of the technicality being taken away. Broadcast-quality cameras take a fair amount of expertise to operate, but devices like the Flip are very easy – just point and press the red button. Enables citizen journalism – source of video feeds for breaking stories, very quick. CNN iReport – embracing this trend; accept submissions, then later stamp with ‘verified’ tag when it’s been checked. (Like many other user-generated content situations.) Part of wider picture of move to mass creation – “We are all broadcasters now” – Martin Weller. Many devices being built with YouTube integration, including televisions coming with YouTube built in. Qik is another example: you install a small piece of software on your mobile, takes the video you’re taking, and it streams it almost-live to the web. Allows anyone to broadcast internationally, instantly. Very easy, spur-of-the-moment. Christian Payne/Documentally uses this a lot, has worked with the OU. The Guild – a TV show only available on the web. A sitcom about online MMORG players. Started in 2007 on a shoestring. Taken up by Microsoft, very large audience. Her Twitter account has 1.3m followers (vs Stephen Fry with 750k!). TV won’t die or go away because of this technology. TV didn’t kill radio. But online entertainment is competing strongly. 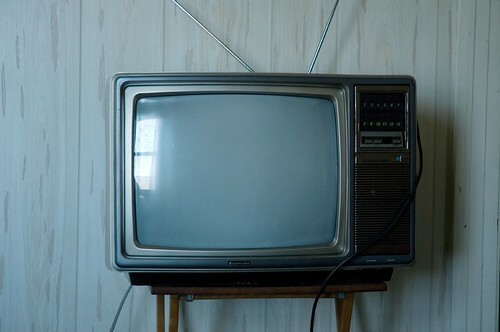 16-24 year-olds are watching less TV than before (OFCOM); big worry for advertisers. The BBC’s role and scope is under scrutiny and debate; the Internet is becoming more important as a medium for them. Slump in TV advertising; more TV channels. A very crowded market place: about 600 channels in the UK! Very uneven distribution. The ‘terrestrial’ channels account for 55% of the viewing, leaving lots of channels fighting over the rest. BBC1 most popular (according to BARB) – about 20% audience share, Ch 5 get about 5%. Then satellite/cable much less – Sky 1 is the biggest and only gets about 1.1%. Advertising decline: revenues falling. Product placement as a way of advertising outside of the traditional commercial break – e.g. Coronation Street characters saying they’re just nipping off to Waitrose. Regional news is very expensive to produce, recent OFCOM – it’s the most expensive form of news, and the benefits to ITV are declining. Also problematic for large disparate regions. Project Canvas: “At the moment TV suffers from basically just blasting advertising across all the channels … It’s not targeted at all. I could be watching hard rock music vidoes and I’ll see an advert for soap” – Brian Turner. Contrast with targeted adverts online like Google Adwords. So bringing in social dimension to TV, useful role for online channels. Examples: X Factor on Twitter. Can see people chatting about programmes in real time. Not (necessarily) officially embraced. An example of media stacking: consuming more than one type of media at once. E.g. typing on laptop while watching TV. OFCOM say 50% of 15-24 year olds do this. 4OD – 4 on Demand, Channel 4’s on-demand video player. Opened up a big back catalogue of content. Problem of content discovery – hard to stumble on TV shows. Was easy when there were only a handful of channels. So Channel 4 integrated 4oD with Facebook – watch the TV show, it turns up in your Facebook status updates, you can tell your friends, and so on – Test Tube Telly. Experiment running till end of this month (September). Boxee is like this. Fully open-source, on Windows, Ubuntu, Mac (including Apple TV, though some issues). Based on XBMC Xbox Media Centre project. Social media for the masses. At the moment need to do a lot of fiddling yourself. Does many media. Boxee is in alpha, not fully released, a few rough edges. Dedicated set-top-box platform – e.g. Project Canvas. Easy to set up, just plug in and it configures itself. Few details released yet. BBC iPlayer on Freesat. The specification for Freesat set top boxes mandates an internet connection; BBC are working on getting iPlayer integration working this way. There are about 50k Freesat installations at the moment. Another major platform is games consoles: there are many, already connected to TVs, reasonably easy to use and are quite powerful machines. More and more becoming multimedia devices – e.g. a Blu-ray player. BBC recently updated iPlayer for Playstation 3 – accounts now for 10% of iPlayer usage! Macs 8.5%. Sky Player will be delivered through Xboxes, on demand – so can get Sky without a satellite dish. Newer Playstations will have on-demand films too. Finally: nettops, e.g. Acer Aspire Revo, about £150. Netbooks:laptops :: nettops:desktops. If just want to browse Internet etc. But are becoming DIY set top boxes. Revo has hardware video acceleration, so video much better, can cope with HD video output. Can interact with it using a remote. Group of OU people want to investigate this area. Can add in applications to Boxee; Boxee held a developer challenge to make some new ones. Very tight timescale – May 5th announcement, June 14th deadline. Minus a couple of weeks of getting approval to do it. Team: Stuart Brown, +someone else, Dave Winter from Comms, Liam, plus feedback from Tony Hirst. OU has big catalogue of podcasts. Plug those in to Boxee to create an on-demand service for this resource. OU has always been on TV; naturally feeds in. We had no big-screen templates for the OU – only brand guidelines, so people know it’s an OU space. Built while being designed – a bit risky. Two bits: server side that sorts out what podcasts will appear; client side that views it on your machine, part of Boxee. The science bit: was built using RSS, Drupal, XML, python. Read the OU podcast website, pulled out information using RSS, also from YouTube; fed in to Drupal which produces another RSS feed. Client app takes the output from the server as RSS, uses XML to present – Boxee uses this to lay out the screen. Python used to provide fancy bits in the design. Can use it using a remote control, can browse OU content on demand. Didn’t want isolated standalone experience; integrated; branded. The Comms people can feature podcasts, highlight things, and so on. So when the OU is running a promotion – e.g. Darwin 200 – can promote on this channel too. To do this: install Boxee, go to the App Box on the left, pick the OU application, it’ll install and sort itself out automatically. The results: came in at 2am (held in San Francisco) – 700 people at the event, 5000 online. All the logos came past while the event was starting. Alas, the OU didn’t win, but did get a lot of praise. Lost one category to an Open Courseware application – vindicates that there is a demand for content in this space. OCW better known in the US than we are. GeekBriefTV very kind – “beautiful, simple, intuitive, as beautiful as it was educational”; Boxee CEO very pleased the OU put an app in (his wife attended Israeli OU). Mention in LA Times, Guardian piece about the competition and the OU application. Optimistic – UK leaders in digital TV adoption. We are well placed to do this. Broadband provision may hold us back, very patchy – even Digital Britain 2Mb universal target, very hard to provide good TV at that bandwidth. Broadcast TV might change – advantage of HD. Sky exploring 3D TV, launch next year. OU well placed – Director of MultiPlatform, Andrew Law – natural fit for us here. Broadcast TV’s view of the world is an unrepresentative rollercoaster; soaps, TV news, very intense, not like real life. But perhaps long-term effect on how we view ourselves with an increasing contribution of mass production of TV. Interaction with screen – size of screen change from 12″ to much larger – does that affect design? Not much; still quite a distance from it. Also people are trying to relax when watching TV, don’t want it too complex. Also influence of existing practice, right back to Teletext, via red button/satellite boxes. Change with computer screens – shift from 640 to 1024 – big difference. Very early days for the ten foot experience. Usage data? Not much yet. Comms working on the statistics. You’re welcome. There’s rumoured to be a podcast video of the talk coming too, although I think I saw the Flip doing the capture run out of battery well before the end! Oh, cool, yes, should’ve linked that stuff in. Fun times for video content, I think.